On February 6, 1832, Osgoode Hall officially opened its doors and the Benchers of the day held their first Convocation in the newly erected building. At that time, the original Hall was comprised only of the Benchers' Quarters. The Benchers' Dining Room is the oldest dining room in Canada still used for its original purpose. 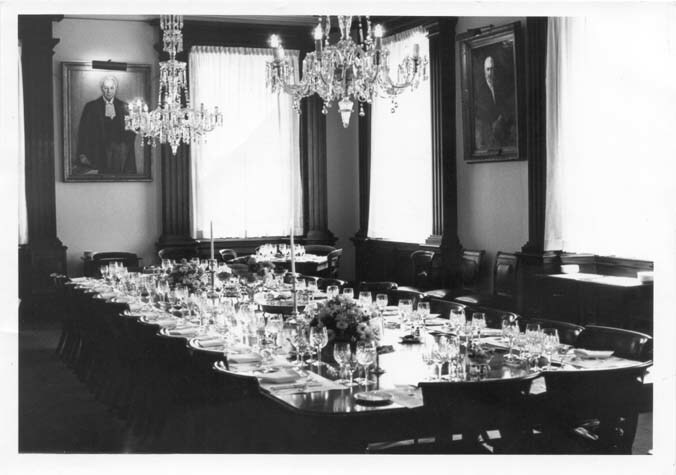 Even during the occupation of Osgoode Hall by the army in the aftermath of the Rebellion of 1837, the dining room served as an officers' mess. Upon entering the Benchers' Dining Room, one is immediately enchanted by its grandeur and elegance. The American Institute of Architects once described this room as "one of the most pleasing examples of the Victorian era it had ever seen". It is interesting to note that when the building was constructed there were only twenty members of the governing body. This meant that not only could this room accommodate all the Society's Benchers but also the entire Bar of the province at that time! The portraits that adorn the walls represent a significant portion of our early history. Dr. William Warren Baldwin was not only one of Upper Canada's most eminent lawyers but also a leading doctor and one of the primary architects of this building. Beside him is Robert Sympson Jameson who was the last British appointed Attorney General before succeeding Dr. Baldwin as Treasurer. Although he had an admirable career, which culminated in his being appointed first Vice-Chancellor of the newly created Court of Chancery he is, perhaps, best known as the husband of writer Anna Jamieson. Robert Baldwin, son of William Baldwin, was the author of the first published set of Law Society Rules, one of the greatest reform politicians in our history, Attorney General and the first premier of the United Canadas. He was also responsible for establishing the system of municipal government in Ontario and the founding of the University of Toronto. John Hillyard Cameron, Treasurer at the time of Confederation, was provincial Solicitor-General and a staunch supporter of John A. Macdonald in the movement for national unity. Sir Aemilius Irving was Treasurer at the admission and Call of the first woman barrister in the Empire. Treasurer Irving also has the distinction of being the longest serving Treasurer in the Society's history and was Canada's oldest practitioner at the time of his death in 1913 at the age of ninety. D. Lally McCarthy succeeded Irving as Treasurer. He was Called to the Bar in 1895 and became the leading counsel of his time. McCarthy was a man with a deep social conscience. In the early days of World War Two, he was largely responsible for organizing the project to bring the children of English lawyers to Canada as "war guests" and he was also the creator of the Barristers' and Solicitors' Benevolent Society. Over the years, this room has been host to several members of the Royal Family, Governor-Generals, Prime Ministers such as John A. Macdonald and leaders of the Bench and Bar of nations around the world. This is just a small sampling of the rich history of Osgoode Hall.